Michelle Madow: Book Expo America! I'm back from NYC, and ready to blog about what happened at Book Expo America! Since BEA is filled with industry professionals, my agent took me and one of her other clients around with her and introduced us to a few editors! This was super cool, and I learned that editors are not scary -- they are, in fact, people too. This was something I learned last year at pitch slams about agents, and apparently the same holds true for editors! The ones I met were all very nice, and it was great being able to meet them! One of the highlights of the Expo was that while at lunch with the group, I spotted R.L. 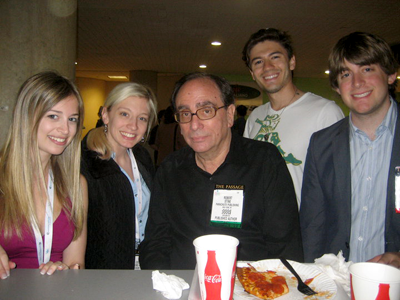 Stine (author of Goosebumps!) walking around searching for a seat. I pointed him out to my brother, and since my brother is very outgoing, he walked up to him and invited him to join our table. He agreed, so we had a 45 minute lunch with R.L. Stine! This was beyond cool, as I read practically all of the Goosebumps books when I was younger and played lots of creative games revolving around the stories. Stine told us that when he writes he always outlines the entire book first, which was an interesting thing to know! His favorite book from the Goosebumps series is The Mask, which I remember vividly from when I was young. (Along with Lets Get Invisible, The Girl Next Door, Say Cheese and Die, and many more!) Goosebumps were so important in my childhood, so it was incredible to have lunch with Stine himself! Me, Colby, R.L. Stine, Daniel, and Steven. My box of books will arrive in a few days, and when it gets here I will let you know which ones I'm most looking forward to reading. There was one in particular that stood out to me -- Matched by Ally Condie -- and I brought it with me to read on the plane. 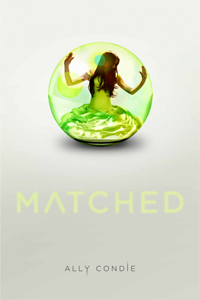 It's a YA novel about a girl living in a dystopian future where everyone is "matched" with someone who is supposed to be their soulmate. The only problem is that she ends up falling for someone who she wasn't matched with, and she has to decide whether to continue obliging by the Society's rules or following her heart. It comes out on November 30, 2010, and I recommend pre-ordering it on Amazon! Anyway, I have to do some editing. I hope everyone's having a great Memorial Day weekend! It was too much fun! I agree; it was so nice to meet so many lovely authors and editors who are real people just like you and me. Hope you've rested up after the exhausting week! very cool! i'd love to go someday!